I was in San Jose last week at TNNA. Here's a photo of Anzula's booth. You can see Celia trying to figure out what I am doing. In the foreground you can see their new bulky yarn, Burly. Celia joined me at the show. We had a great time. Getting home was a major thrash. You wouldn't think that a flight leaving at 1pm would be a red eye but that is what it turned out to be. Due to bad weather in Georgia, I didn't get home until 5am. A couple of lessons were waiting for me when I got home but it didn't take me long to get caught up. I spent most of the week ordering yarn for the next issue of Cast On. It is a very time consuming process so I was glad I didn't receive a glut. I reviewed several lessons which inspired this weeks topic. I've said it before that when it comes to weaving in yarn tails using the duplicate stitch method, you either see it immediately or you really have to work at it. As a reminder, the duplicate stitch method works very well for stockinette stitch as the yarn tail has the same elasticity as the surrounding stitches, it doesn't show through to the RS and it doesn't pull free. Most other methods don't do this. I've worked a swatch that has several different things I've seen in swatches lately. #1 shows a technique I saw in a lesson. The knitter was attempting the duplicate stitch but didn't quite get it. #4 and #5 are something you see in quite a few references. The tail is run diagonally through the stitches. It is elastic but it does show through. #2 shows duplicate stitch done correctly but rather than slightly split the stitches on the WS, the needle has gone under the stitches completely as you would for decorative duplicate stitch. #3 is where the yarn is split. And here is how the various techniques look on the RS. If your yarn tail is the same color as the rest of the yarn, the bleed through isn't the end of the world but it does look tacky. Notice that #2 doesn't look terrible but there is some bleed through. You don't see any purple on #3. For students that are having a tough time with this, I recommend working a swatch like the one below. Salon will be on Sunday from 1:30-3:20. The Spalding donuts were a hit last time. This time I have all the goodies I picked up at TNNA. I love that they are doing Cash and Carry now, not that I need more yarn! I finished up a hat for the KAL. I quite like it. I still have yarn left so I might make another one while I am waiting for my Cast On yarn to come. 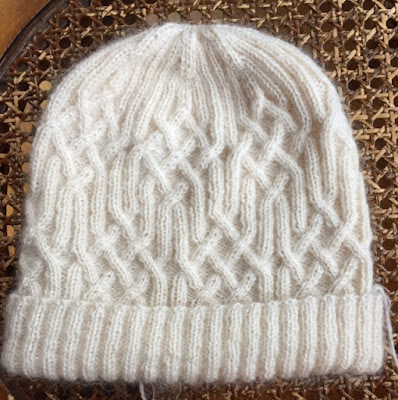 I also wound up knitting several hats for non-knitting friends. I forgot to get photos, alas. I'm almost finished with Jan's B-day present, VERY LATE. She made a resolution this year to start wearing colored things. This falls into that category! I designed these socks eons ago. I called them Leaves of Spring which could describe the color as well! With Level 1, no problems were noted with my weaving in of yarn tails using duplicate stitch, however, reviewers had placed threads on several swatches at the path I took to get (from c/o or b/o row) far enough into the swatch to avoid incorporating either c/o or b/o into the dup. stitch. 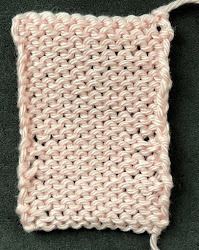 Could you please demonstrate the start of weaving in, using a yarn tail at the beginning or end of a swatch.